Clay’s Caleb Cline signed to play golf at Kentucky Christian University on Tuesday afternoon in Rosemount. Over the last four years, two-sport standout and Clay senior Caleb Cline has embraced any role that has been expected of him — whether it’s been a role-playing guard on a regional final unit, a No. 1 golfing hand on a competitive conference and district-contending golf unit, or a leader for a younger unit that was expected to take its fair share of lumps as the year went on. Through all of the varying roles and all of the struggles that come with the dedication and hard work that’s necessary to truly embrace those roles, Cline persevered. And as a result, Cline has fulfilled a personal dream of his own. The star golfing hand, who also proved to be an integral part of the Panthers’ basketball program throughout his four-year career, made his intention of playing golf at the next level official as the senior officially signed to play with the Kentucky Christian University golf program on Tuesday afternoon in a signing ceremony held at Clay High School. For Cline, the decision, after weighing several options, was one that brought relief, and joy, to the senior’s mindset. The positive attitude that Cline exudes, however, is a big reason why Kentucky Christian University men’s golf coach and Hidden Cove Golf Course Park Manager Steve Kennedy was attracted to what the senior could bring to the table for KCU. Cline, who went wire-to-wire as the team’s consistent No. 1 scoring punch, also proved himself as arguably the best golfer in Scioto County as far as the Division III ranks were concerned in his final season of action. Overall, Cline shot an 86 at the Division III Sectional Golf Tournament, which was held at Shawnee State Golf Course on Wednesday in West Portsmouth, to advance to district play by claiming one of the five district-advancing individual slots. Cline, however, hasn’t just contained his natural talents to the course — he’s displayed them on the basketball court, as well. The upperclassman contributed in a major way to the 2017 Division IV District Champions and Division IV Regional Finalists by sinking a pair of free throws with less than 40 seconds left to send Clay’s Division IV, Region 15 Semifinal bout with Grove City Christian to a second overtime, then knocking down the go-ahead basket with 42.4 remaining in that second overtime to give the Clay basketball program its biggest win in 48 years, and added 9.1 points, 5.6 rebounds, and two steals in 2018 to obtain Special Mention All-Southeast District, Second-Team District 14 Coaches Association, and First-Team All-SOC honors. At Kentucky Christian, Cline will be sharing a similar experience with a fellow teammate of his. Caleb Castle, who graduated from Morehead (Ky.) Rowan County, also played basketball. Castle quit the sport to focus more heavily on the golfing aspect beginning with his junior year, which parlayed into an opportunity to play golf at Shawnee State, before making the move to KCU. The ever-growing Clay-to-KCU pipeline, however, certainly doesn’t hurt any. 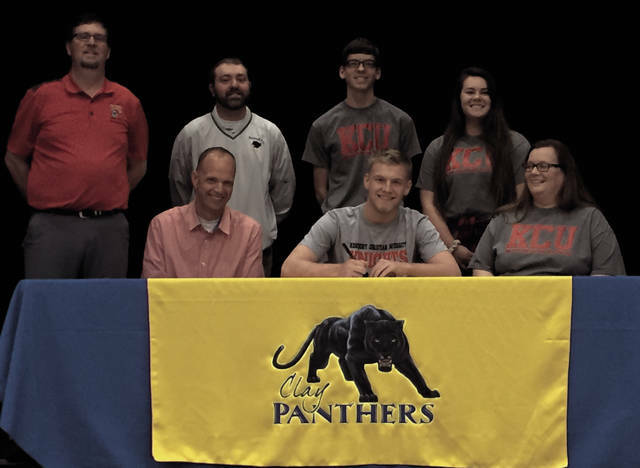 In fact, Cline will be joining an ever-growing line of student-athletes who have chosen to attend the institution, including Katie Redding, Lexie Gilliland, and Cole Gilliland — the latter of whom Cline played with at KCU. At Kentucky Christian, Cline also plans to major in education, with the hopes of becoming not only a schoolteacher, but a basketball coach in the future, so the senior can help kids recreate the special memories that he experienced at Clay himself. And it’s an experience that has inspired Cline to do all that he can in order to ensure that his time at Kentucky Christian is a success.